The Hungry Ghost Festival celebrates the Taoist belief in the afterlife. Chinese communities in Malaysia and Singapore believe the gates of Hell open on the 7th lunar month, freeing the spirits of the dead to roam in the world of the living. The living, in turn, must make offerings of food and burnt prayer money to the souls of the dead to appease them. The ghosts in question inspire both pity and fear. The spirits who roam the earth during this time have been denied access to Heaven for some reason, or have no descendants on earth to make offerings on their behalf. The former will look for any living being to take their place in Hell. The latter are starved from their year-long stint in Hell and seek sustenance during their earthly furlough. The spirits of dead ancestors, though not as needy as the ghosts described above, are also celebrated by their living descendants during this time. Throughout Singapore (particularly in Chinatown) and in Chinese enclaves in Malaysia (Penang and Melaka's Chinatown chief among them), Chinese go all out to feed and entertain the roaming ghosts. The festivities reach a peak during “Ghost Day,” the 15th day of the “ghost month” - that's the best time to go around town and see the following take place. More modern entertainments like karaoke and dance contests are also held on these stages, presumably for the spirits of the more recently deceased. In Singapore, you'll find the most well-attended getai performances in Chinatown, Joo Chiat, and Ang Mo Kio. Each of these stations can be easily reached by MRT – through namesake stations for Chinatown and Ang Mo Kio, and via Paya Lebar station for Joo Chiat. In Penang, Chinese opera and puppet shows are conducted in three different languages - Hokkien, Teochew, and Cantonese - and staged mainly around George Town area. To satiate their dead relatives, Chinese will offer meals and burn joss sticks, "hell money" (wads of fake paper money), and assorted paper versions of earthly goods like TVs, cars, and furniture. The Chinese, who believe that the ancestors can help them and their businesses from beyond the grave, do this to ensure continuing blessings and protection from beyond. Food offerings are also left along roadsides and street corners, and outside houses. The latter theoretically prevent hungry ghosts from entering residences - after all, with food just waiting outside the door, who needs to go inside? Visit the local Taoist temples and wet markets to see the most spectacular displays of food offerings for Hungry Ghost. These displays are usually overseen by an effigy of the Leader of the Hungry Ghosts, the Taai Si Wong, who gets first dibs on the food on the table and keeps lesser ghosts in line, preventing them from doing too much mischief during their time on Earth. Penang boasts of the largest Taai Si Wong in Malaysia, which is set up every year at Market Street on Bukit Mertajam. These places are usually fragrant affairs, as the air will be thick with the smell of burning joss sticks. Giant "dragon" joss sticks loom over the smaller sticks, like fenceposts in tall grass. The giant joss sticks are usually placed by businessmen, who seek the favor of the spirits so their businesses will do better. On the 30th day of the seventh moon, the ghosts find their way back to Hell, and the gates of the Underworld are shut. 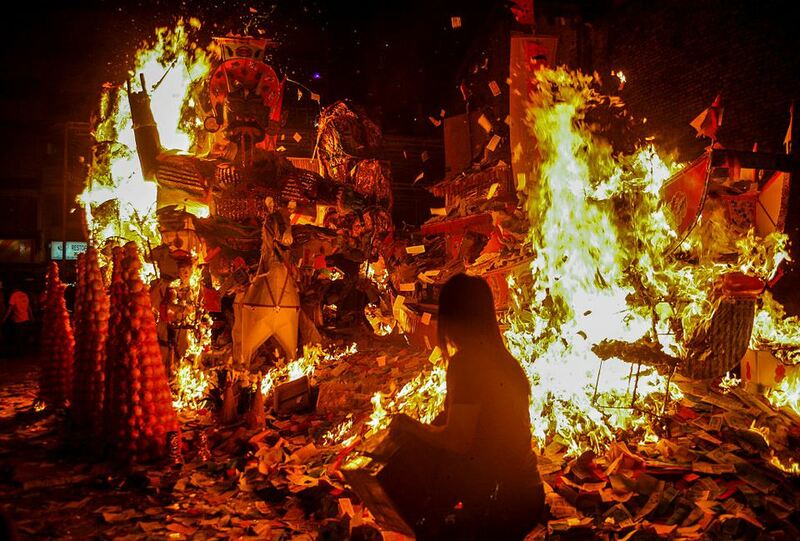 To see the ghosts off, paper offerings and other goods are incinerated in a giant bonfire. The Taai Si Wong effigy is burned along with the rest of the goods to send him back to Hell. The month of Hungry Ghost Festival is, generally speaking, a bad time to do anything. Many significant milestones are avoided at this time, as people believe it's simply bad luck. Chinese believers avoid traveling or performing any significant ceremonies throughout the festival. Businessmen avoid riding in airplanes, buying property, or closing business deals during Hungry Ghost Festival. Moving house or getting married are frowned upon during this time - it's believed that ghosts will mess up one's plans during the festival, so your house or your marriage may be jeopardized at this time. Swimming is also a scary prospect - children are told that hungry ghosts will pull them under, so they will have a soul to take their place in Hell!